In 5 days this little piece of internet real estate will turn 5. Yup, it's blog birthday time already! Since five is my favorite number and is a bigger deal than, let's say four, I have decided to, five days before the birthday, to post my five favorite posts over the past 1,820 days (which amounts to 5,615 blog posts, in case you were wondering. I know, mind = blown.). For the next five days I will bring back one post from the past five years that I loved. The ones that I wish they could all be like...but they aren't. Sometimes I just don't have the energy to be awesome, sue me. For my first Five Year Flashback I give you - a letter to. Over the years, my letters to random individuals and celebrities have become fan favourites (mom, dad, childhood neighbour Glenda - I appreciate your feedback). They started with a letter to a theatre full of tweens and have gotten better over time (according to Glenda). And finally...one of the best: A Letter to the girl sitting behind me. Enjoy. I have decided, instead of writing a regular review of this concert, to write you a letter so you can better understand your effect on my concert going experience. You were pretty mellow at the beginning of the night. You weren't really feeling Travie McCoy. Me neither...what was he doing up there? He kind of just walked back and forth on the stage and attempted to get the crowd amped up. If he didn't get you pumped up there was no way it was happening with the rest of the audience. You do need to know however, that the opening band usually does more than two songs. After the second one you said, "Ok we get it, now get off the stage." I wondered if you have been to a concert before...most have an opening band. If you didn't want to hear him you should have come later...a lot of people did. During the break between Travie and Ke$ha you started losing your mind in anticipation of the Dirt Queen. 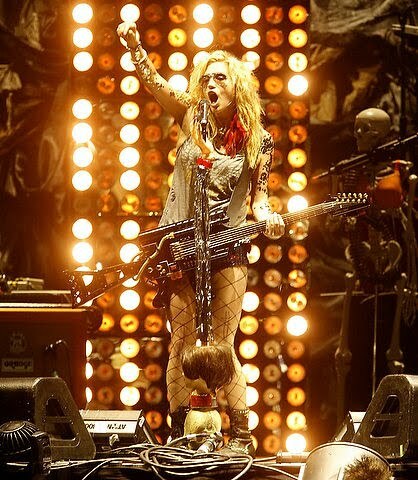 I believe you said "I would have paid $500 to see Ke$ha up close"...why? So you could see how greasy her hair really is? You tried to buy 5th row seats but they were $300 and your friends wouldn't splurge with you. You were devastated and couldn't understand why they were so expensive. You compared this concert with Greenday...Greenday was cheaper...well of COURSE it was. John Mayer was cheaper than this so get over it. You then said that you loved Ke$ha almost as much as you loved Hilary Duff. Duffster? Seriously? I thought you were kidding until you said to your friend that you that you have a H Duff tattoo...this is just too good. So we lied to you and told you we were Duff fans as well and asked to see your tattoo...you showed it to us AND you let us take a picture. Best moment of my life. Dignity, you told us, was the name of your fave Duff cd. 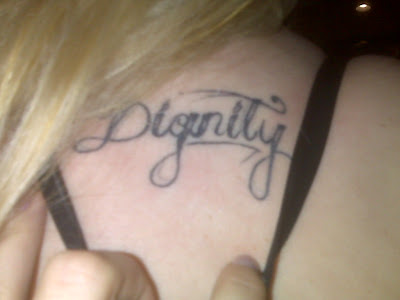 Dignity is something that you could not possibly have after getting that tattoo. Ke$ha came on and I seriously thought you jizzed in your pants. I must say that you may have done a better job dancing on stage than her dancers. They were brutal. Ke$ha sung my least favorite song Dinosaur. You loved it. I am still trying to figure out how old you were based on the fact that you liked H Duff, you have a tattoo and you were pounding down the beers like a liquor store had a 5 cent sale on Lucky. 19? If you tell me you are older than 20 I will have to slap you. Ke$ha finished up her set...it was super short...like 20 minutes. I was waiting for you to complain...or cry...or just drop dead, but you hung in there. I was very proud. You must have loved it cause you proudly proclaimed "I love her more that Hilary! "....uh oh, do I sense a Ke$ha tattoo coming on? May I suggest a dirty looking t-rex since you loved Dinosaur so much? I wasn't sure if you were going to be down with Rihanna since you hadn't talked about her at all then...SURPRISE you know the lyrics to all of her songs....and you sang them...loudly...and VERY out of tune. I am pretty sure during Fire Bomb she glared at you for butchering her ballad. Ok, maybe it wasn't directly at you...but in your general direction. Now if RiRi could hear you just think about how my ear drums feel. You can apologize whenever. I also accept gifts (an iPhone would be nice). You seemed to be so involved with your own voice and dancing that you weren't really paying attention to the amazing production going on stage. Her costumes were scandalous and did you notice all of the weapons? I think Ri has some anger issues. There was a neon pink Tank, rifles, machine guns, and nun-chucks. Then it was over and we all went home. I ran to the train just in case you were taking the same one as me. No offense, but I needed to get away from you. I hope you are not hungover today...it's possible, as you put the bar out of business. Next time you are going to attend the same concert as me can you let me know...just so I can plan on being on the other side of the dome. That is unless you get a Ke$ha tattoo. If you do let me know so I can come see it.